Hope you are having a Happy Halloween! The winner of my Moda Give Thanks charm pack is #20, Fiesta of Quilting Fiesta Blog. I will email you privately for your address so that I can get your charm pack in the mail soon. A couple of weeks ago I was contacted by Dutton Publishing asking if I would like to read and review an advanced copy of Jennifer Chiaverini's newest book, The Giving Quilt that will be available in bookstores tomorrow, October 30, 2012. And of course, I jumped at the chance. The book highlights Project Linus which is a charity that I've made blankets for the past several years so I couldn't wait to read it. In The Giving Quilt you will revisit Elm Creek quilters that are familiar and also meet new quilters. The group has come together for a special winter session of quilt camp the week after Thanksgiving to sew for "Quiltsgiving" where they spend the week sewing quilts to donate to Project Linus. On the first night of quilt camp at the candlelight ceremony they are asked the question, "Why do you give?" As several of the quilters become friends through taking Gretchen's Giving Quilt class, you will read their individual stories and the experiences that have brought them to Elm Creek. These quilters inspire each other and give back to their fellow campers and remind us why it is truly better to give than to receive. Here is my start of the Giving Quilt that Gretchen taught in her class in the book. The block is called Resolution Square, and the measurements for the block are given in the book. Jennifer Chiaverini is a New York Times bestselling author, and I am sure that if you are a quilter and a reader, you are already familiar with her Elm Creek Quilt novels. Her book goes on sale tomorrow, and this story is well worth reading. I love Halloween. I always have orange lights on the bushes in the front of my house, and my lighted ceramic pumpkin is in the window. This year I've added this little ghost. This year I went a bit overboard with these faux pumpkins like you see in the photo below. I bought my first pumpkins at the dollar store and decorated them with duct tape. You can see that post here along with a photo of a few of my pumpkins. By the time I started pumpkin shopping, everything Halloween was at least 50% off. They have been marking down Halloween decorations for most of October to make room for Christmas decorations. An old white twin size sheet or enough fabric to drape over the cage. Bend the prongs of a tomato cage and duct tape them into a shape that will look like the head of the ghost. This doesn't have to be perfection as you can see in the photo below. Wrap the cage with the white lights. Use the permanent marker and draw a scary face on the sheet. My daughter says this guy looks clueless!! This is how he looks after dark. This is Ghostie. He's been hanging around for years--since my children were young. From now until Halloween, there is a Wicked Blog Hop going on over at Sew We Quilt. Every day there is a group of talented bloggers showing their wicked Halloween projects. Thursday is my day to show you my project, and I'm having a little giveaway so I hope you stop by. 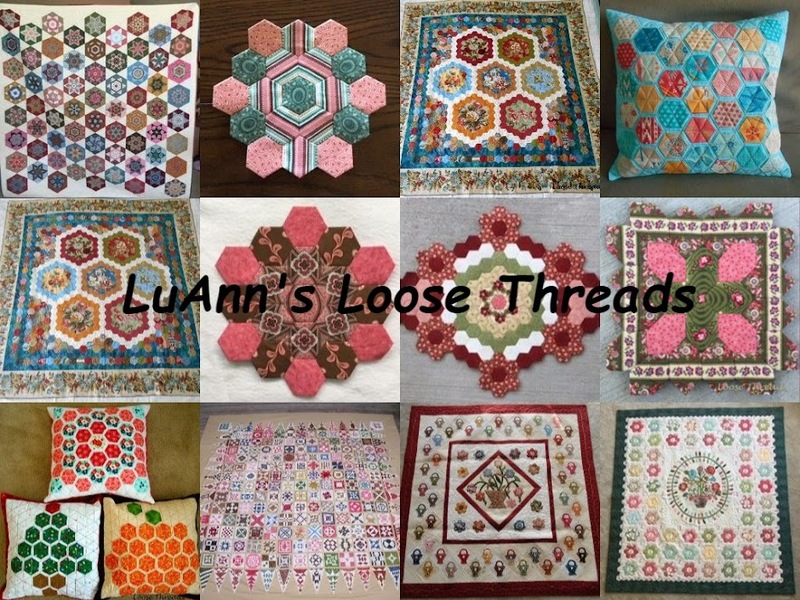 If you hop on over to Wendy's blog Why Knot Quilt you can get the complete list of wicked hoppers. I'm featured in this week's edition of the on line magazine called Bonbon Break. 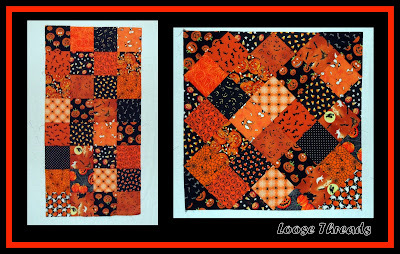 My small Halloween quilt is featured in the Mom Cave section along with a link to the tutorial. This little table topper was made from sewing 5 inch charm squares together into a rectangle and with two cuts you have an on point quilt. This is the quilt that I pieced from the little tumbler kit that I won a couple of weeks ago from Kathy at Inspired by Antique Quilts blog. I added just a couple of tumblers from my own stash to finish out the final row. I hand pieced the tumblers together because it seemed easier to line them up and almost as fast as machine sewing them. The border is machine sewn onto the tumblers. This gives you an idea of the size of each piece. The tumblers finish about 1 1/4" tall, and I plan to hand quilt them. This was a fun little project, and it was really nice to have a precut kit come to my mailbox all ready to sew. Thanks again Kathy for the nice giveaway. This is a little Christmas quilt that I just finished binding. I made this as part of a challenge with a group of quilting friends that meets two or three times a year. We were given the dark red and dark green fabrics you see in my quilt, and the challenge was to make something with triangles. I started out making 8 or 9 broken dishes blocks and then filled in the rest with other half square triangles. I used the method of making 1 1/2" half square triangles from charm squares. The tutorial can be found in my post here. It is also linked on my side bar under Tutorials and Patterns. The little quilt measures approximately 14". I machine quilted a simple grid and used the #4 stitch on my Bernina to quilt the border. This is another of the waterfalls that we saw on vacation. This is my kind of waterfall. If you look near the top of the photo you will see a bridge. That is the road, and just to the right of the photo is where we parked the car. I only had to hike about 25 yards on flat ground to see this. The noise from this falls is like Niagara only much quieter. a runny nose before we left and was on an antibiotic. She had almost stopped eating so my son took her to the vet on Thursday per our request to stay and be treated until we got back home. She seemed to be doing okay, and then Friday morning the vet called to say she had stopped breathing on her own. 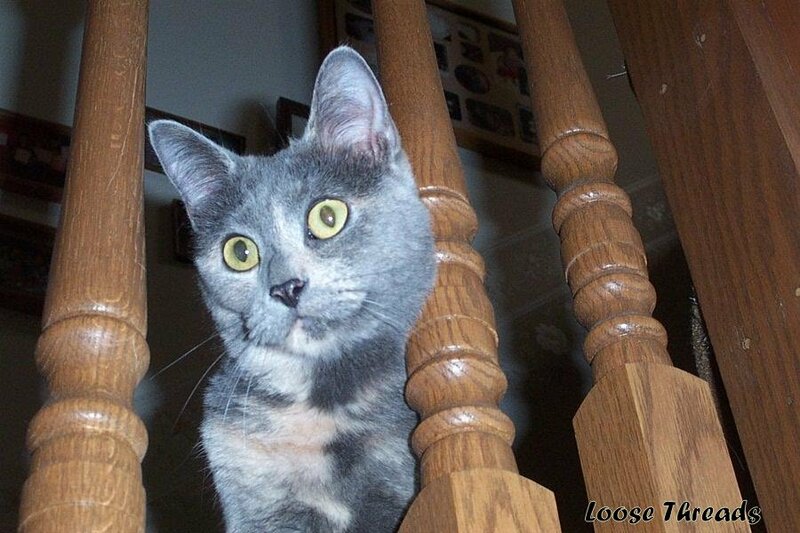 Squeaky was a little over 8 years old, and had spent 7 of those years here with us. When our daughter moved to Huntsville, Alabama, for a job, she took Squeaky to live with her and then kept her in Lafayette, IN, for two years while she did Master's work at Purdue. The two of them were best buddies. Squeaky always came along on Kim's visits here, and she was a big part of our family. The two of them have lived here since last December. The house is so quiet. She was always in someone's lap or watching the squirrels or birds or the leaves blowing outside. Squeaky seemed better on Sunday morning when we left. I can hardly believe that we came home to an empty house and that she won't be coming back. Squeaky, we will always love you and miss you. I try to keep my blog to happy subject matter...quilts, yarn projects, holidays, etc., but today my heart just aches. I just finished this little Halloween quilt/table topper. It was made from charm squares that I had left over from another Halloween quilt. I really didn't like the fact that the points of the squares would be cut off when sewing the binding on, so I trimmed off the outside to leave about a half inch seam allowance. I machine quilted the pumpkin patch design found at Day Style Designs by Leah Day. When riding in the car, I like to stitch down quilt bindings to make the time go faster. We finally did make the hike up to Laurel Falls yesterday. The hike was 2.6 miles, but it was worth every step. This is just a sample of the fall color here. I'm on vacation in the Smoky Mountains. I've been sitting out on the porch this morning waiting for the fog to lift so we can go check out a couple of water falls. The view is gorgeous, and the weather is supposed to clear up by early afternoon. The fog is lifting nicely, but it is just taking awhile to totally clear in the upper elevations. While waiting, I've been stitching on the little fall tumbler quilt kit that I won from Kathie's blog, Inspired by Antique Quilts. You can see the size of the tumblers compared to the coffee cup. I don't have a ruler with me, but I would guess they are 1 3/4" tall. I had forgotten how relaxing it is to hand piece. I hope you are all taking it easy and finding some time to do some stitching today. If you are reading this right now, chances are you enjoy blog surfing. You can get lost in photos of beautiful homes and gardens, tablescapes, holiday ideas, lovely quilts, crocheted and knitted items, etc. Have you ever stopped at a blog and saw something that you just knew you had to make? Me, too. That's exactly what happened to me. I saw a post on the blog Confessions of A Plate Addict about decorating pumpkins with duct tape. It sounded interesting so I read on. The blog post not only told me where to go to buy the faux pumpkins but where to go for the duct tape (the package calls it Duck Tape). Her pumpkins came from Dollar Tree, and the duct tape from Michael's. So off I went to Dollar Tree and bought the last two of these little pumpkins that they had. I had a 40% off coupon for Michael's so I stopped there for the duct tape. This was one of those things that sounded so good until after I had a good night's sleep. When I woke up the next morning I wondered, "What was I thinking?" But, I already had the supplies. I painted the stems black with the paint that I bought for my adventure into clothespin painting last spring (a story for another time).